WASHINGTON, July 7 /Christian Newswire/ -- Christian group launches new effort in their campaign to educate American voters on the radical and extremist abortion policies of Senator Obama. 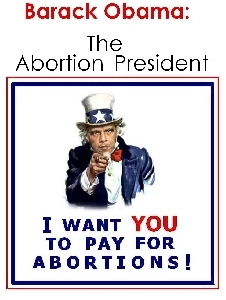 The campaign called, "Barack Obama: The Abortion President," will focus on how Mr. Obama wants taxpayers to pay for abortions. The Christian Defense Coalition will have a news conference on Tuesday, July 8, at 11:00 A.M. to discuss this new campaign. They will also have large color posters and fliers. The location of the news conference will be in front of Mr. Obama's senate office in the Hart Senate Office building on the Constitution Ave. NE entrance side. A major part of the news conference will center on the fact that Senator Obama wants people of faith, Catholics and Evangelicals, to pay for abortions through their tax dollars. Although in recent days Senator Obama has tried to downplay his extremist views on abortion, his own Presidential website says, "...he has been a consistent champion of reproductive choice and will make preserving women's rights under Roe v. Wade a priority as President." Rev. Patrick J. Mahoney, Director of the Christian Defense Coalition, states, "Senator Obama talks about bringing hope, faith and change to American politics. We now see this is all just political 'doublespeak.' One of his top priorities as President would be protecting abortion rights and even expanding them. If elected, Senator Obama would become 'The Abortion President,' with the most extremist policies on abortion of any President in history. "Senator Obama's views on abortion are so radical that he even wants American citizens to pay for them. This would include Catholics, Evangelicals and all people of faith. He would also expand abortion rights through his passionate support of The Freedom of Choice Act. "The Christian Defense Coalition will be working diligently over the next 5 months before the November elections to educate people of faith, especially Catholics, that Barack Obama wants them to pay for abortions. This is not a candidate who is concerned about social justice, hope and equality. Rather, this is candidate who will continue the violence and pain of abortion and refuse to end this tragic war against America's women and children." Kaitlin Clare, Program Director for the Christian Defense Coalition, adds, "As a 23 year old woman of faith, I am appalled at the radical and extremist abortion politics of Senator Obama. This is not a progressive view on abortion or one that affirms women. As most of this emerging generation is embracing a 'culture of life' and growing less comfortable with abortion, Senator Obama wants to take us back to a radical pro-abortion posture that is both archaic and disturbing. "Senator Obama, this generation will not go back to the violent days of abortion on demand with no restrictions. It is very confusing that you do not want tax dollars going to pay for the deaths of American solders in Iraq, yet you want each of us to pay for the killing of innocent children through abortions here in America. "We also want to remind Senator Obama that although we may be more progressive than our parents on the environment, social justice and other cultural issues, we could never vote for a President that wants to expand and embrace abortion policies that diminish women and violate human rights."